The Hanoitimes� – The signing of the EU-Vietnam Free Trade Agreement (EVFTA) will create a big step in Vietnam’s government procurement field as foreign investors will be allowed to take part in the market for the first time. Government procurement is about how public authorities spend public money when buying goods, works or services. This can range from buying IT equipment or providing water, gas and electricity, to building a hospital or a road. Currently, foreign firms are not permitted to engage in bidding activities for government-funded projects as Vietnam has not agreed to make its government procurement subject to the Government Procurement Agreement of the World Trade Organization. However, the country is taking this step for the first time with the EVFTA, which is due to be ratified next year. Under the deal, European companies will be able to bid for public procurement contracts in Vietnam under the same conditions as Vietnamese companies, for a selective number of entities. Experts said that European firms really want to partake in government procurement contracts in Vietnam and many of them have and will come to Vietnam in search of these opportunities, because these contracts can bring them many opportunities. Each year, the Vietnamese government invests billions of dollars into infrastructure projects, many of which must be put out to tender. According to a recently released guide to the EVFTA, Vietnam is one of the countries with the highest ratios of public investment to GDP in the world. Since 1995, this ratio has remained at over 39 percent annually, with a large part invested in infrastructure projects. Last year, the ratio was 35.7 percent, or US$26.45 billion, of the total development investment capital. Duong Kim Khanh, general director of pharmaceutical firm Lynh Farma in Ho Chi Minh City, said that many foreign firms wanted to engage in contracts at local hospitals, but failed. Therefore, Vietnam’s commitment to government procurement under the EVFTA sounds good for them. Experts said that the government procurement provisions in the EVFTA are a big step for Vietnam as Vietnamese suppliers will have access to the EU’s US$500 billion public procurement market. Besides, Manfred Otto, Senior Associate at law firm Duane Morris Vietnam, said that for Vietnam and its people, the EVFTA’s government procurement provisions should, over time, improve access to high-quality goods and services from European suppliers. 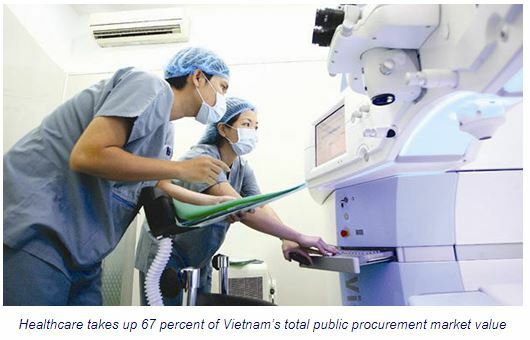 Improvements are especially expected in the healthcare and life sciences sectors, as Vietnam’s public procurement in these sectors takes up 67 percent of the total market value. Vietnam has committed to give EU suppliers the right to bid for up to 50 percent of the pharmaceutical purchases by the Ministry of Health and many of the hospitals under its control, as well as major research facilities, Otto said. However, this is a very gradual process over a period of 15 years after the FTA comes into effect, he added. The right to participate in Vietnam’s public tenders will initially be limited to relatively high-value contracts – those worth at least US$2.1 million or US$4.2 million depending on the procurement agency. For construction work, the initial thresholds are even higher at US$56 million. This is probably meant to protect Vietnamese small and medium-sized businesses. The EVFTA also contains specific transparency and other requirements to support the procurement process itself, including an independent administrative or judicial authority where suppliers can challenge awards.